Authorities estimate 6—8,000 attended the demonstration, slightly less than took to the streets of London June 9. The smaller turnout may have been attributable to the event coinciding with England's third-place World Cup playoff against Belgium that day. The Facebook pages of many of the groups most vocally supporting Robinson, such as The Football Lad's Alliance and Democratic Football Lad's Alliance, made clear many members would be watching the match, rather than carrying placards. Tommy Robinson, left, the former leader of the far-right EDL "English Defence League" group walks past police officers as he leaves after an appearance at Westminster Magistrates Court in London, Wednesday, Oct. 16, 2013. Nonetheless, a variety of organizations and individuals did make an appearance, which was hosted by Breitbart's former London Editor Raheem Kassam, former chief advisor to Nigel Farage. Among the crowd were United Kingdom Independence Party (UKIP) leader Gerard Batten MEP, who spoke at the June 9 protest, and Paul Joseph Watson of InfoWars. A video fronted by Watson encouraging UK citizens to join the party has since been uploaded to UKIP's website — a call answered by controversial YouTubers Sargon of Akkad — real name Carl Benjamin — and Count Dankula — real name Mark Meechan. The latter was $1,100 (£800) in April for posting a video to the streaming site in which he taught his dog to perform a Nazi salute, and repeatedly said "gas the Jews". Robinson — real name Stephen Yaxley Lennon — was arrested May 25 for breaching the peace outside Leeds crown court by using social media to broadcast an hour-long video at the courthouse. He was soon sentenced to 13 months in prison. Robinson has also received direct financial assistance in his legal troubles from an extremist think tank — the Middle East Forum (MEF). This backing has gone almost entirely unmentioned in the mainstream media, despite the organization publicizing its activities on its own website. The MEF's statement also makes clear it has funded and will fund future ‘Free Tommy' protests. MEF said it was helping Robinson in "his moment of danger", in the context of its ‘Legal Project' which since 2007 has "defended activists, journalists, politicians, et al. who face harassment, fines, or imprisonment because of their views concerning Islamism and related topics". 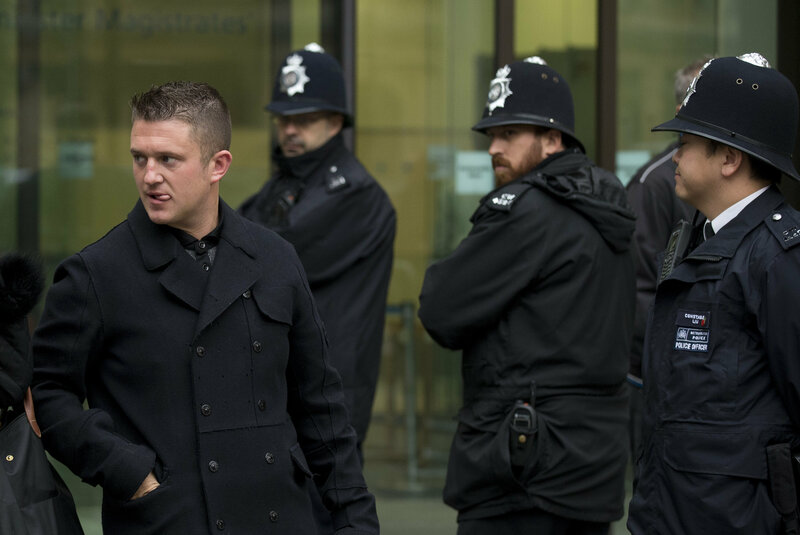 The organization noted this support came in "three main ways" — by funding his legal defense, "bringing foreign pressure on the UK government to ensure Robinson's safety and release", and organizing and funding ‘Free Tommy' rallies. In this Saturday, Jan. 21, 2017 file photo, Dutch populist anti-Islam lawmaker Geert Wilders delivers a speech at a meeting of European Nationalists in Koblenz, Germany. Far-right Dutch politician Geert Wilders, who was scheduled to speak at the ‘Free Tommy' demonstration but cancelled last minute due to apparent security concerns and instead appeared via video link, has also received backing from MEF. In particular, the organization funded Wilders' legal defense in 2010 and 2011 against charges of inciting racial hatred, sending money directly to his lawyers. In the event, the Freedom party leader was acquitted of all charges, with the court finding he'd stayed within the limits of free speech. 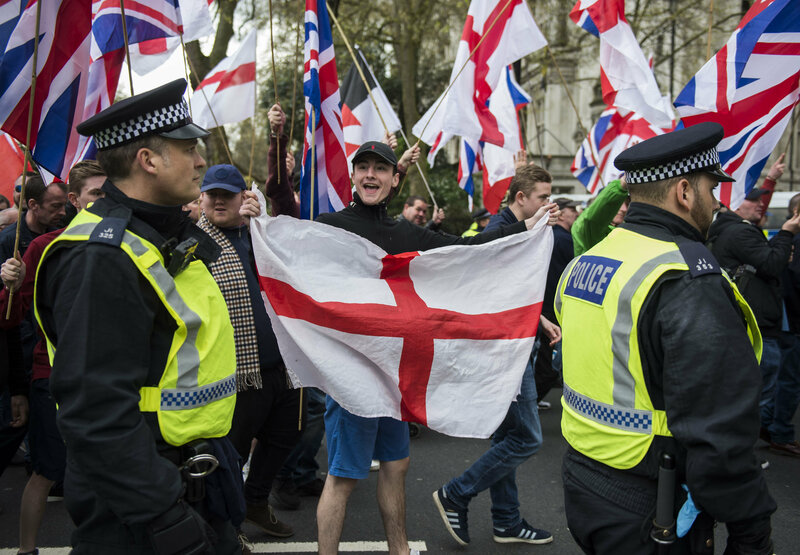 Britain First and EDL (English Defence League) protesters walk along Northumberland Avenue during a demonstration in London, Saturday, April 1, 2017. In a 2010 article, Daniel Pipes, MEF's President and a prominent neoconservative figure, called Wilders "the most important European alive today", saying he was the politician "best placed to deal with the Islamic challenge" facing Europe, and "has the potential to emerge as a world-historical figure". While claiming in that piece to "disagree with Wilders about Islam" — "I respect the religion but fight Islamists with all I have" — he was vilified widely for promoting the notion of Muslim-dominated ‘no-go zones' in France, claiming in 2006 over 750 such areas existed in the country. He subsequently apologized for making such suggestions. Despite this apparent retraction, he has also in other articles unapologetically encouraged law enforcement to profile Muslims, claimed "available evidence suggests [Barack] Obama was born and raised a Muslim and retained a Muslim identity until his late 20s", demanded the banning of burqas and niqabs in Western countries, and opposed the building of an Islamic center near the former site of the World Trade Center, saying the campaign for its construction was led by "unsavory Islamists" and carried "the unmistakable odor of Islamic triumphalism".